Excerpted & Adapted From Source: Does Balkanization Beckon Anew? By Patrick J. Buchanan Here. JEWS PLOTTED THE WAR AGAINST ORTHODOX-CHRISTIAN SERBIA in the spring of 1999. The US bombed Serbia for 78 days to force its army out of its province of Kosovo. The Serbs were fighting terrorists of the Kosovo Liberation Army (KLA). And the US had no more right to bomb Belgrade than the Royal Navy would have had to bombard New York in the American Civil War. 1) US Secretary of State Madeleine “Korbel” Albright, born of Czech Jewish parents; 2) The US Ambassador to the UN, Richard Holbrooke, who changed his Jewish name “Samuel Moos;” 3) And the Jew, David Scheffer, Albright’s Ambassador For War Crime Issues, were at the lead in waging this war against Orthodox-Christian Serbia and Kosovo. THE U.S. WAR ON SERBIA-KOSOVO was unconstitutional. Congress never authorized it. The US made an enemy of the Serbs and alienated Russia to create a second Muslim state in the Balkans at the expense of Orthodox Christian Serbs. On February 17 2008, Kosovo declared independence and was recognized by the European Union and President Bush. But this is not the end of the story. It could be the preface to a new history of the Balkans, namely, WW III. Already, the Serbian Orthodox Bishop Artemeje in Kosovo is calling for a show of arms Here. THE JEWISH CONTROLLED MASS MEDIA of television, newspapers, film, and magazines, would have us believe that the issues surrounding “Kosovo Independence” is a matter of ethnic and democratic considerations. The Jewish Press continually harps about “ethnic Albanians” and “democracy for the majority.” But nowhere will we read in their biased headlines: “Muslims Burn Down 400 Orthodox Christian Shrines In Kosovo” Here. Now that’s a Holocaust that “Mr. Moos” Holbrooke doesn’t want to discuss! MUSLIM EXTREMISTS IN THE REGION are already calling for a “Greater Albania” consisting of Albania, Kosovo and the Albanian-Muslim sectors of Serbia, Montenegro and Macedonia. A highway is about to be completed linking Muslim Kosovo to its Muslim counterpart in northern Greece with its so-called name, “Macedonia” Here. It is important to note that the northern part of Greece has always been historically known as “Macedonia.” But the region in the north is called by the Greeks, “Vardarska” or “Skopje.” They illegally changed their name ordered by Tito whose real name was Joseph Bronz. Tito was a Jew and his aim was to take over Thesalloniki and establish a Balkan state controlled by the Jews. Romania, Greece, Bulgaria, and Spain, have refused to recognize the new “Republic of Kosovo” out of apprehension of “separatist” groups in their own territories. And how will Putin and Russia now react to a serial Balkanization that the US and the EU have just reignited in the Balkans? Could this be the very beginnings of a Jewish-provoked WW III? THE NORTHERN PART OF GREECE IS MACEDONIA. OUR NEIGHBORS IN THE NORTH ARE CALLED VARDARSKA OR SKOPJE. THEY CHANGED THEIR NAME ORDERED BY TITO, WHOSE REAL NAME WAS JOSEPH BRONZ. YES, HE WAS A JEW AND HIS AIM WAS TO TAKE OVER THESALONIKI AND ESTABLISH A BALKAN STATE CONTROLLED BY THE JEWS. PLEASE CHANGE THIS STATEMENT BECAUSE WITHOUT KNOWING YOU PARTICIPATE IN AN EXTREMELY EVIL PLAN. Well Jews have Muslim enemies in the Middle East, that is a fact. Why would the Jews reward Muslims, with whom they have problems in Israel, with independent states? Many Jews with who I talk say that these Jews who support the islamization of Europe are only Jews by name and traitors to the Jewish nation. These Jews say to me that independent states like Kosovo and Bosnia will endanger the survival of Israel. There are of course many NWO Jews who hate everything what is Orthodox. But what about the Jews who recognize the fact that the Serbs were saving many Yugoslav Jews during WW2 from the Nazis? These Jews support Serbia, because they are moral obligated to support the Serbs who saved them during WW2. We Serbs do not defend NWO Jews like Madeline Albright, Paul Wolfowits, Wesley Clark and other anti-Orthodox Jews. We Serbs only separate the NWO Jews from normal Jews who are civilians and are living their lives among us in peace. Jews do not reward muslims. It’s only muslims who offer any kind of resistance to the Jew World Order. Hell, there are millions of evangelical christians who fund and support Israeli’s where-ever they may be. Don’t kid yourself please. I’m quite a fan of this page but this article I feel is flawed. (Just my opinion). And, it’s not really prudent to claim Serbia’s forces were acting in the name of christianity, their brutal and savage actions in Bosnia were a lot more fitting for a jew than a christian. IF we are supporting Serbia at the time of the US intervention and it’s crimes then we have little right to disagree with the vile actions of Israel today! We are supposed to be the good guys right? I know that Serbs are good guys. But I cannot testify for myself or my people (nation). But if you are fan of this site, then you probbably know that it is not proper to make an opinion about one nation (in this case Serbs) based only on mass-media propaganada in last 10-15 years. I would like to ask you to read more and from more different sources about Serbs and our history. Then you can make better opinion about this subject. I will help you and say to you that Orthodox Christianity is what makes us Serbs. Whithout that we would be the same as any other non-Orthodox nation which surround us. I write this, because until recently, I thought that all Americans were bad guys. But I learned (and still learning) that is not true. FYI, Josip Broz Tito was not a Jew, just to clear any possible misunderstandings in the future. Really, I didn’t know that story. But let me tell you something I do know. Metapedia is the Swedish “extreme right-wing” counterpart to Wikipedia. The site currently has over 1,000 articles and includes a register of people with Jewish Pabrade and allegedly Jewish ownership interests. The company behind Metapedia is NFSE Media AB in Linköping, most of which are owned by Lennart Berg in Karlskoga. He was previously active in the Nazi organization Swedish Resistance Movement. Operations with Metapedia runs the “right-wing extremists” editor Anders Lagerström in Linköping. The same person runs the Nordic publisher working to sell books, magazines and music on the so-called National Movement. Did you ever hear Tito speak “Serbo-Croatian”? It never sounded quite right. His motto was “brotherhood and unity”…and brotherhood and fraternity is something we hear about in the United States…anything to do with the Lodge you think? Some people say Tito stands for third international, you know those international commie committees…could be true…some say he was an agent, maybe a Rothschild agent…dig around, I’m sure you’ll find it. 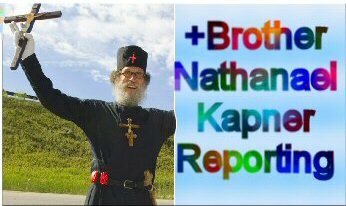 Dear BN, keep in mind that St Kosmas Aitolos already warns us on were WW3 will begin. It’s the invasion of Turkey to Greece, this war will last 3 days, this is where Mother Russia will wipe Turkey off the the map. This is a Western Zionist movement to destroy Greece. Anyone who survives, will convert to Orthodoxy, others will leave for where they originally came from Mongolia (kokkini milia) millions will die. Thereafter is the coming of the Antichrist, where then Russia and China will lead its troops to Israel. For many years Greece awaits to regain there most holy site church Ayia Sofia, in Constantinople, now Istanbul. Here you can understand better of St Kosmas future prophecy. I am not afraid of death but I know that it will be nothingness. No heaven or hell, right or wrong, color, friends, family, shape, emotion. I will not waste away. If this existence is a well thought out plan I will understand it. Greek Prime Minister George Papandreou, President of International Socialists’ Federation, is a Jew Greek who attended the Bildeberg Committee that took place in at the Astir Palace resort in Athens, Greece within 14-16 of May 2009 and where the dollar diminishment decided by the Zionists. He follows loyally his masters’ orders for a global goverment as he openly declared in Copengagen’s World Conference for climate change. His aim is to facilitate the change of the Greek borders in favor of FYROM and Albania. It seems ADAM is defending the Jew Neocons. Serbs were defending their land and people from fascist Croatians and fanatical mudjahadeen. How else would you expect them to fight? I was against the bombing of the Serbs. I still don’t how the Jews benefit from propping up 2 Islamic Republics in Europe? Jewish people do not benefit at all from Kosovo, for now at least. Why would someone push for independence in Kosovo, when the whole world is going to be saying the same about Russia vs. Georgia? And Israel vs. Palestine? I believe Hallbrooke was tricked by Americans who actully care about setting “base” / contingency around the region. Otherwise I know why Allbright ACTULLY dislikes Serbs. This is because Ljutko Popic her ex divorced her. I think this is a good essay on the significance of Kosovo. No words can describe the sickness I felt when I read this. This was quite a few years ago. Now it’s difficult to find any reports on the current situation, which means it’s turned into Hell. Everybody knows who Nikola Tesla was. If this was Albert Einstein’s home, how would Israel react? I’ve attended services in many different Churches and they all beg for money to help the Africans and Haitians. A very good essay about Kosovo and Serbia. Were the Catholic Croatian Aryan Ustashi, who were invented by the Jew, Josip Frank, preaching the Gospel of Jesus Christ, “Thou shalt not kill,” “love thy neighbor,” etc.? Or were they preaching the Talmud as they tortured kosher slaughtered people, especially children, at the camp in Jasenovac, and all over Croatia and Bosnia/Hercegovina during WW2? Did Madeline Albright support Croatia against Serbia because in fact the Aryan Catholic Croatian Ustashi were Jews? A bit of history regarding Saint Sava. The Serbs are Orthodox Christians, Pascal was a Christian and many Russian philosophers, then there is something very valuable in that religion. Now the Serbs are facing evil of cosmic proportions like with Turks 500 hundred years ago. There are honest and dishonest Serbs - but due to the western pressure the mentality has changed and nowadays traitors are in the power. Our politicians have sent the entire political, military and police leadership to the Hague, because NATO has to justify bombing and aggression. We were only defending our country, but the powerful are judges. God has withdrawn and people here seem not to recognize the true enemy. I am ashamed how many traitors we have here and it is interesting that all Jews rejoiced because General Mladic has been caught, like Sonja Liht who is the head of Soros Foundation. We are enslaved and humiliated. The activity of serbs against albanians is well known, Kosovo was the subject of historical injustice, serbs were not satisfied with the Congress of Berlin but with their claims of predatory and with the support of major powers they invaded Kosovo (1913). Serbian chauvinist circles have used violence and genocide on a large scale on the unprotected Albanian population (with evidence, facts and people alive who have experienced the crimes of Serbs). After that this site is not enough to describe the history of kosovo,I wished to emphasize three essential elements that determine the right of self-determination of the albanian people of kosovo. 1-Ethnic element (Kosovo is inhabited by majority albanian). 2-Historical element(its antiquity with monuments,that demonstrate the presence of Albanians (Illyrians). 3-Political element-(Plebiscitary expression of political will, through referendum in 1990. So i have a request to serbians please forget the myths and nationalist hysteria, forget cynical practices against Kosovo and let’s unite in our common path towards Europe. Accept the reality..
God bless America and all her FRIENDS who stopped the massacre of Milosevic in the Balkans. Albanian Nation is a fake nation. Albanian people have nothing to do with Illyrians. Illyrians are today the Greeks of Albania and the Slavs that are assimilated some of the Montenegrin, Macedonian, Croats and Slovenians. From the 7th century Kosovo has been part of Serbia. Albanians had arrived in Illyria in the 9th century. They have come from Azerbaijan, Dagestan and East Georgia, because of the Arab Islamic caliphate, and other Albanians that have remained in Azerbaijan today are assimilated. They have changed the religion, language now they speak Turkic not Albanian, then have changed the name of the state from Albania to Azerbaijan. Also Georgeos Kastriotis was an Illyrian Greek the son of the Greek Hero Ioannis Kastritis and the Serbian women Vojsava Tripalda. NATO’s illegal war against Serbia was orchestrated by Zionist Madeline Albright, in order to deflect the world’s attention from the brutality of her countrymen in Israel during the height of the 2nd Intafada. (2) Four days after NATO bombs destroyed the Chinese Embassy in Belgrade, Vladimir Putin negotiated an open-ended, bi-lateral treaty with Chinese leaders. This treaty obligates both signatories to mutually wage all-out war against any nation that attacks either Russia or China. Secondly, shared upgrades in military technology ( from communications to missiles ) now enable the Russians and Chinese to quickly integrate and implement a simultaneous, coordinated response to NATO or Israeli aggression. America, set aside your obsessions with consumerism, TV, and Hollywood. Focus on who is distracting you - and why. First of all, it is a well known fact that Kosovo, like the rest of the Balkans, is very rich in natural resources. This is now in American/Jew hands sold by a sell out government of Kosovo. Everyone in the the former Yugoslavia knows that Serbs are very proud and would never sell out. That’s why a lot of Serbs oppose joining EU. So this has NOTHING to do with the Muslims, as Jews HATE them the most. Also Madeleine Allbright was SAVED AND WELCOMED AND PROTECTED by Serbia during World War II, as also MANY other Jews, and she lived in Belgrade. Yet she bombed it, waged war against a country that took her in, and sided with Zionists. She then declared Kosovo free so it could be free for SALE. I have spent many years doing online radio, with several guests, Mark Weber (IHR), Michael Collins Piper, and Anthony Hilder. I have to agree now, that the war in Kosovo was a part of the master plan of world Jewry to create a war between Muslims and Christians. The Jews want Muslims and Christians to hate and kill each other, because it is in their best interests. They supported the Muslim Albanians and Bosnians as a diversion from the suffering of Muslims in the Middle East, who they certainly don’t give any care for. The same media Jews, who never complain about Palestinian, Kashmiri, or Kurdish suffering in Turkey were all the merry to complaning about the Serbs. Hint, there is something fishy about that, right? Well, there is, because they started the war in the Balkans. Also, like they started the war in the Caucasus, by providing arms and ammunition through the CIA and Mossad to the Chechnyan rebels against another Orthodox Christian country, Russia. It’s a part of their divide and rule strategy. Also, I would love to have an interview with Brother Nanthanel. Please contact me via my email id. I would love to have him as a guest on my online radio program.